Thanks to Mobile Cloth for sponsoring the site’s RSS feed this week. They’ve just launched their revamped website and it looks great. 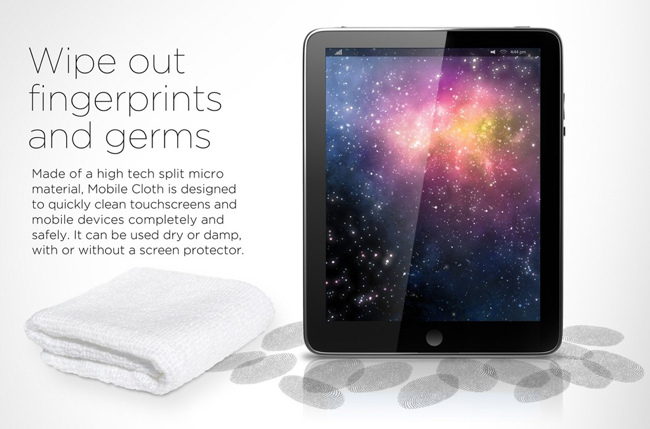 Mobile Cloth are easily the best cleaning cloths I’ve ever used on my iPad and other touch-screen devices. They’re the quickest way to keep my iPad display free of fingerprints and smudges. They come in a standard handkerchief sort of size and a smaller Nano size – and I’ve nearly always got one close to my iPad. Exclusively for iPad Insight readers: enter “IPADINSIGHT” into the coupon box upon checkout and receive 25% off and free shipping on all orders over &25. This coupon code is valid until August 27. Check them out at www.mobilecloth.com. I keep getting “Coupon code is invalid.”. I don’t think you should be telling people they will get 25% off, if it isn’t true. Hi Linda, coupon is fixed please shoot an email to [email protected] and I will take care of you. Hi All – sorry for coupon snafu… it is fixed now if you tried to use before please contact me and we will take care of you. Thanks!